Pillows-cushions have always been relevant in any interior. There are many options for decorating them in any style. It's nice when the house has pillowscushionsmade with their own hands, they bring a special comfort at home. Prepare the polyester cushion, which will be the basis of a pillow. To do this, simply roll the batting into a roll. Calculate the amount of material by measuring the length and circumference of the roller. Length of material needed to make folds on the sides of the roller equal to its circumference, and the width of its radius. According to the length and circumference of the cushion cut the fabric into the desired interval. Also cut the fabric into the bias tape, which will turn over the cushion on the sides. Put bake on the pins, keen. For the sides cut two pieces of fabric the length of which is equal to the circumference of the finished cushion, and the width is equal to its radius. Add 1.5 cm for seams. Pristrochite cloth over the edge at the sides of the main cut. Sostrochite side seam on the main piece, not forgetting to leave a hole for taking out the cushion. 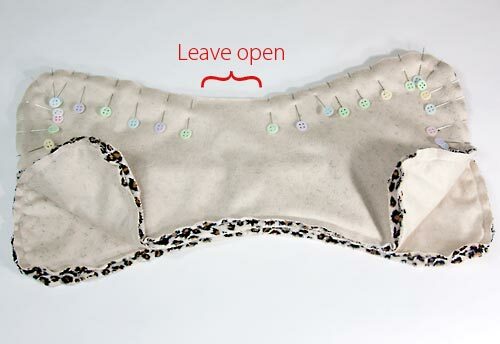 Sew this hole zipper. Iron all seams. On lateral cuts on the edges make two lines in order to prioraty folds. Stitched strands gently pull to the hole. The tied ends of the wrap strong thread near the coupling threads. Turn the cover right side out. Matched or covered with own hand sew buttons to the center of the Assembly to the sides of the cushion. Insert polyester fiber cushion sewn cover. If you want to sew a pillow cushion with flat sides and a clearer form, use the previous scheme, replacing ruched side two cut out fabric circle. To do this, cut out of paper, the sample for the cushion size and then find out two fabric circle, adding to the entire circumference of 1.5 cm for seams. Sostrochite side part with the main, do not forget to insert between the trim piping. Then sostrochite main part by inserting a zipper. Who does not want after sleep to feel healthy and rested, not to feel pain in the neck and back? Probably want all. The way out of this situation there is the use of orthopedic pillows. Basically, it is used for the prevention of diseases of the cervical spine. Orthopedic pillow is double sided and can serve people of different ages, height and weight. Sew this pillow is very simple. Its creation will bring you lot of fun and will not take much time. Decide on the style of cushion. 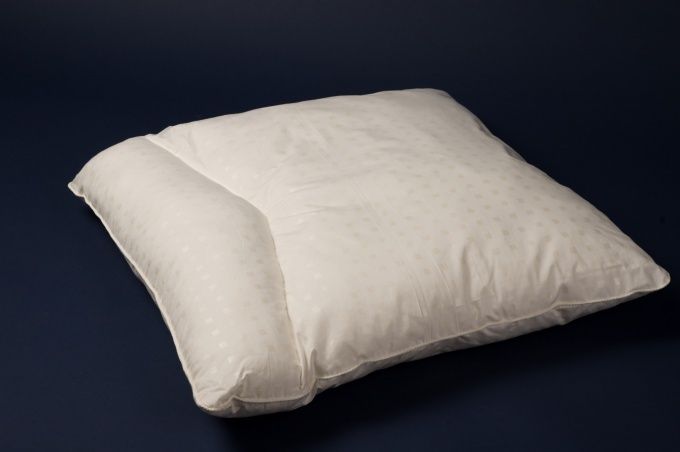 Usually orthopedic pillow is sewn in the form of beads of various sizes. 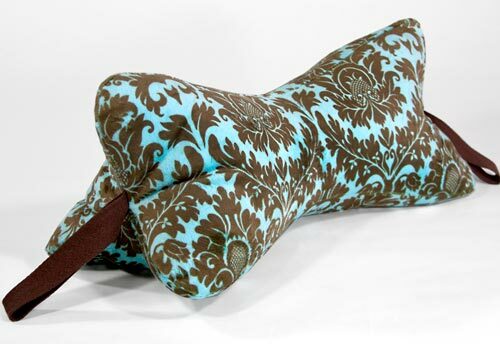 The dignity of orthopedic pillows is that the pillow is as if adapts to your posture and body shape. Take a look and try to imagine industrial orthopedic pillows and roughly estimate its size. If your head easily and conveniently, then the size fits you. Focusing on this, you will be able to choose the size of your future pillow. Select a suitable fabric for the cushion. It is desirable that it was a natural fabric, pleasant to the body. Make pattern pillow the shape you like. On the Internet there are many sites that offer sewing patterns of all forms of pillows for download, may wish to use them. 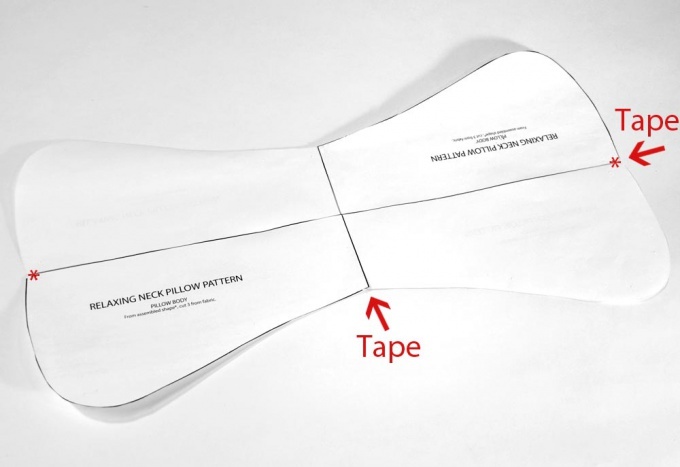 Take the pattern roller and apply it to the selected tissue. You must leave a centimeter or two of the allowances for seams. Take two parts. Fold parts of the outer side on the inside. Billet sew three sides completely, and leave the fourth for stuffing. If you want you can do the remaining side of the zipper or buttons, in order to be able to change or add a gasket. Remove there. Invest in cushion filler. Orthopedic pillows industrial production filled with latex, viscoelastic foam or polyester. At home you can fill a pillow with buckwheat husks, which provide massaging effect to your neck and will serve as the basis for a healthy and sound sleep. Sew to pillow removable pillowcase. It is practical and beautiful. The external part of the pillow you can decorate to your taste. It can be decorative applique pieces of fabric, different color and texture, or pattern transferred to the fabric. 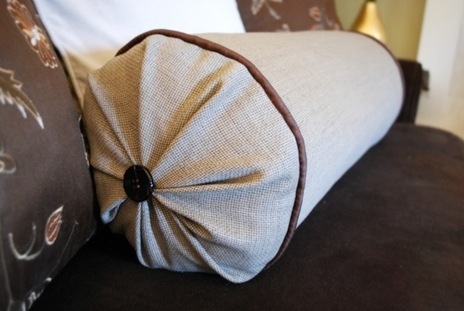 How it will look in your new orthopedic pillow depends on your imagination and skillful hands. If after sleeping on a pillow you're not feeling well, you should change the filler in the pillow on the other. Sometimes it only takes a few accessories to the interior sparkle with new colors. A small highlight in the selection color or detail can sometimes achieve a stunning effect. For example, cute decorative pillows cushions. If the interior is already such a willing pillow, you can just change her cloth or her add tassels or laces. A little time will require preparation of a new cushion pillow. Decide the size of the future pillow. Consider where the pillow will lie if it should be contrasting in color with the sofa. Maybe you want to make a few short pillows candy. Promerita the length of the future roller, the radius and the circumference. Calculate the necessary amount of tissue. 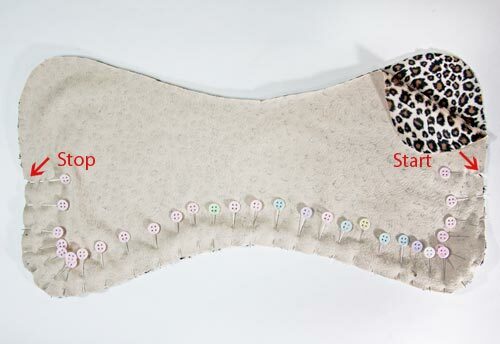 If you plan to make a cushion with the "tails", then add to the length of the desired number of cm on the tails. The width of the piece of fabric must be equal to the circumference of the future product, plus 3-4 cm at the seams. Purchase required amount of fabric and detail of the decor. Keep in mind that the thicker and denser the fabric, the harder it will be to collect it in ponytails. And much crumbling at the edges of the fabric difficult to process and can spoil the look of the pillow. Cutting the material. You have one long rectangle (pillow with tails) or a rectangle and two round parts on the ends. If the fabric is dense enough to enhance its cushioning tissues should not be. Pillow - candy. Fold the rectangle in half, how many needles and baste on the long side. Prostrochite on the machine. Remove the basting and the needle. The short side sweeps, with tucked fabric in half, to avoid fraying the edges. Route engine line. Can do decorative double line of thread of a different shade. Pillow with flat ends. Take one item - a rectangle the size of the cushion and two of the circle equal to the diameter of the ends. Detail of the middle part of fold the face inward and prostrochite on two sides 5-7 cm to the point of closure (buttons or zipper). Seam Ratatouille and vsheyte the zipper or buttons (buttons). Side round details sew to the middle, folding them right sides inward. Divide the stitches evenly. Turn the finished cover on the front side. Make a filler. Foam, padding polyester, or any remnants of fabrics make roller. To do this, roll the foam roll and sew along the long side to hold the shape. Carefully put the cylinder in the finished cover tightly and tamp it remains fur scraps or pieces of batting. 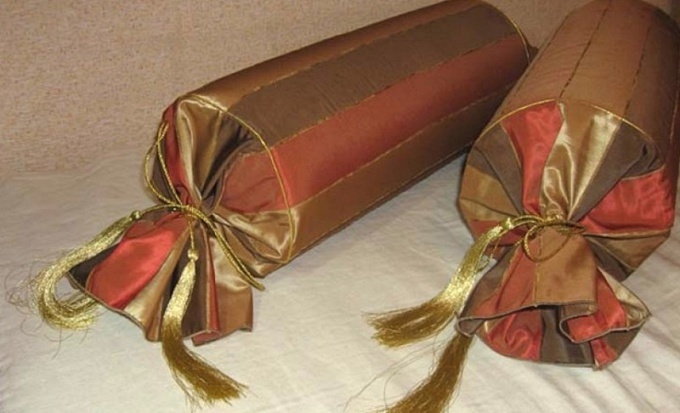 Decorate the finished product is decorative cord, carefully tying it at the ends of the pillow, or sew the tails. 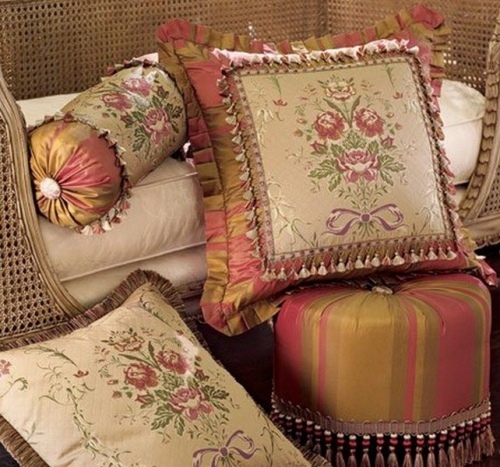 Also pillows can be decorated with embroidery, to embroider with beads or beads. If the roller is planned in the children's room you can decorate it with appliqué to make a funny cat or dog, a Dachshund. This pillow will be not only pleasant but also useful gift. The pillow has a special shape in the form of pits, and therefore fit comfortably on the neck. Pillow-bone – relieves tension of the neck muscles and improves circulation. It is convenient to use at home and on the road. Cut out fabric 3 equal parts, using the pattern of a butterfly. On the center side mark with a pencil where the handle will be attached. Two strips of fabric sewn handles. Fold the two parts of the cushion, right sides to the inside and tack from one pencil mark to the other. Also tack handle. Stitching. Next, tack the third item and stitch, leaving a small hole. Gut-wrenching, stuffed with filler and sew up the hole hidden seam. Where the handles are attached, preferably to flash a couple of times that they kept a tighter hold. Stuff the pillow with the filler need not adhere to a pleasant softness. If you fill the pillow with buckwheat husk, pillow will acquire such useful features as: normalization of blood pressure, reduced fatigue, head and muscle pain, massage neck and breathability.